The SAFE Delaware County Coalition will dedicate its annual traffic crash memorial to the 20 teens that have died in the county during the last 10 years. The ceremony is scheduled for 10 a.m. on Wednesday, Dec. 6. Twenty wreaths will be displayed in front of the Ohio State Highway Patrol Delaware County Post #21, 1500 Columbus Pike, Delaware. The SAFE (Safety Awareness For Everyone) Delaware County Coalition will dedicate its annual traffic crash memorial to the 20 teens that have died in Delaware County during the last 10 years. 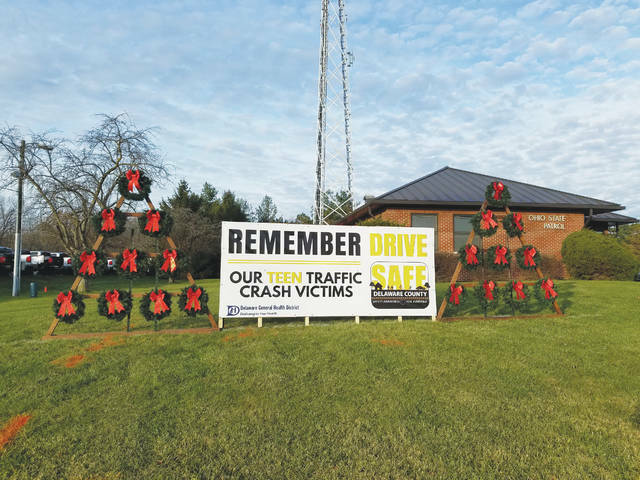 Twenty wreaths will be displayed in front of the Ohio State Highway Patrol Delaware County Post #21, located at 1500 Columbus Pike in Delaware. The coalition was chosen to remember these young people after the recent rise in teen-involved fatal crashes in the county. Family and friends of those lost and community members are invited to attend the wreath memorial on Wednesday, Dec. 6 at 10 a.m. at the Ohio State Highway Patrol Delaware County Post. Bain said that the last two years have seen a dramatic increase in teen traffic deaths, seven of which have occurred within the past two years with five being Delaware County students. In addition, half of the 20 killed were passengers not wearing seat belts. In response to the recent crashes, some parents have stepped forward to form a new SAFE Teen Drivers committee to take action against this alarming trend. The mission of SAFE Delaware County is to serve as a countywide network that joins community partners, maximizes resources and provides leadership to prevent injury and fatalities in Delaware County.